This year will mark the start of the area's much needed £2billion renovations with the unveiling of the new western concourse. The restoration includes an incredible 1,200 tonne wave structure of steel and glass which has been designed by John McAslan and Partners, and has taken three years to construct. John McAslan and Partners is also the design company that was responsible for the transformation of the London Roundhouse with its stunning glass lantern centrepiece, that allowed natural light to pass through the centre of the building for the the first time since the 1860’s. 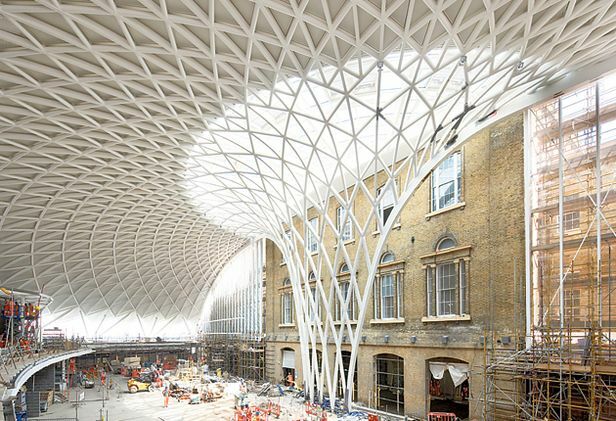 Under the watchful eye of English Heritage, the architects have successfully incorporated an incredible glass roof structure within Kings Cross Station, supported in 17 places, to maintain the original building’s facade within the redevelopment. Once complete, the station’s concourse will be an open and inviting space, and more than six times the size of the original concourse, with natural light flooding throughout the elegant and clean design. With the old and new sitting side by side, the new Kings Cross Station will be finished in time for the 2012 Olympics and will celebrate London’s rich history and its promising future. It will be an amazing example of how 21st century glass technology can compliment and revive the surrounding traditional architecture. In recent years Pilkington has been involved in similar restoration projects where our glass products have been used in bringing back to life buildings that had long lost their former glory. Products such as Pilkington Activ™ self-cleaning glass uses daylight to break down dirt through the ‘photocatalytic’ process and then rainwater to rinse the dirt off the coated glass, and is ideal for buildings that incorporate a large glass structure such as Kings Cross station. Not only does this make maintenance of cleaning larger glass structures quicker and easier, it saves money that would be normally spent on manual cleaning and removes safety risks involved in a window cleaner having to climb the building, it also allows Pilkington glass technology to sustain the beauty of large glass structures for the future.